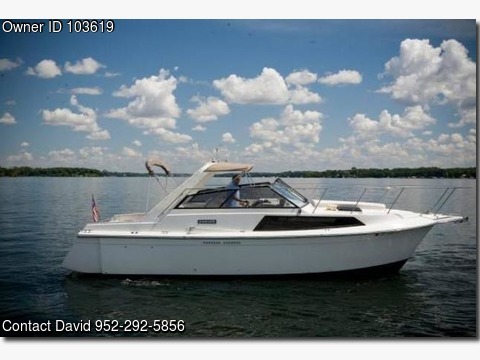 Boat is located in excelsior,MN.Please contact the owner @ 952-292-5856...This SOLID, Very Clean, low hour, 1985 Carver 2987 Monterey is a GREAT family express cruiser with a roomy interior and a surprisingly spacious cockpit. The Monterey differs from most express boats this size in that it's powered by straight inboard engines, a setup that will appeal to many cruisers who prefer the dependability only inboards can provide. Built on a solid fiberglass hull, the Monterey's wide beam together with the modest transom deadrise results in a smooth and stable ride. The bi-level cockpit is arranged with a wet bar with newer 'L" shaped bench seating forward while the entire aft section of the cockpit is wide open with a custom fold down bench seat. Easy access to the bow area via a "normal" staircase takes you to a very spacious sunning area, complete with large sun cushion. The like new salon with custom drapes, provides berths for four in the cabin along with a galley, removable dinette table, head with Vac U Flush toilet and shower. The helm is clean, with onboard alarm system for high water, CO, Fire, w Halon system, horn, wiper, VHF radio, sound controls, etc. etc. The boat solid, with all working systems. Has integrated swim platform with ladder, not a bolt on complete all weather canvas with different options for enclosing entire cockpit, or partial. Includes custom canvas winter cover which covers the entire boat. Twin 270hp Crusader gas engines cruise at 18 knots and reach a top speed of around 28 knots. An excellent and very clean cruiser for the price.